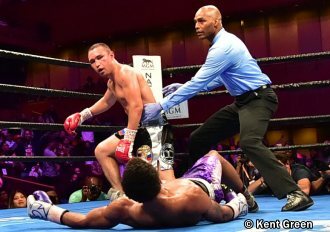 NATIONAL HARBOR (March 25, 2019) - Former world champion Sergey Lipinets (15-1, 11 KOs) stopped former two-division champion Lamont Peterson (35-5-1, 17 KOs)in round 10 Sunday night in an action-packed welterweight showdown that headlined Premier Boxing Champions on FS1 and FOX Deportes from MGM National Harbor in Maryland. The night also featured Anthony Peterson (37-1-1, 24 KOs), Lamont's brother, as he fought to a split-draw against former champion Argenis Mendez (25-5-2, 12 KOs) in a back-and-forth super lightweight showdown. "He had the reach and I was trying to catch him. I was throwing my hook but I was a little off. I still think I won the fight. I caught him with the better shots. He was just slapping me with the hook and trying to catch up that way. "I boxed a little bit better the last few rounds and used my height," said Clark. "I made him miss and made him over reach. That was the game plan." "I've been down before and I've seen the worst of the worst," said Clark. "This was nothing. I just kept grinding. I got the win and now I'm going to sit down and see what's next for me." "If they want to do it again, let's do it again," said Brown. "Let's make it a 12 rounder. I don't think he can survive 12 rounds with me. My coach knew that I needed the knockout but it's still on to the next. I'm just going to go into the gym and work even harder." For more information: visit www.premierboxingchampions.com, http://www.foxsports.com/presspass/homepageand www.foxdeportes.com, follow on Twitter @PremierBoxing, @PBConFOX, @FOXSports, @FOXDeportes, @MGMNatlHarbor, @TGBPromotions, and @Swanson_Comm or become a fan on Facebook at www.Facebook.com/PremierBoxingChampions, www.facebook.com/foxsports and www.facebook.com/foxdeportes. The event was promoted by TGB Promotions and HeadBangers Promotions.